There are dozens of products available for fertilizing your lawn. Some are for winterizing. Some kill weeds while feeding your lawn. Some include pesticides. Some are useful for brand new lawns, while others claim to revive old ones. There are organic fertilizers, like Milorganite, and chemical fertilizers, like Scotts. Know what each offers before you choose one to apply. Both Milorganite and Scotts lawn fertilizer are designed to nourish your grass. Because grass is the largest plant in your yard, and the one that receives the most abuse from weather, insects, drought and mold, it requires the most maintenance. It also needs feeding more frequently. Milorganite can be applied to the grass using a broadcast spreader, as can Scotts fertilizer. But it's easy to over-apply Scotts fertilizer, which results in burned grass. Minimize applications to early spring, midsummer, and late fall, and strictly follow the suggested settings for your spreader. Milorganite is an organic fertilizer that contains very low amounts of nitrogen and won’t burn the grass even if over-applied. Apply Milorganite in early spring, midsummer and late fall. If grass looks yellow or otherwise unhealthy, you can safely reapply Milorganite. Bags of Milorganite and Scotts fertilizer display three numbers that refer to nitrogen (N), phosphorous (P), and potassium (K). The numbers indicate the distribution of each element within that fertilizer. For example, a bag that displays 30-12-9 indicates a mix of 30 percent nitrogen, 12 percent phosphorous, and 9 percent potassium. 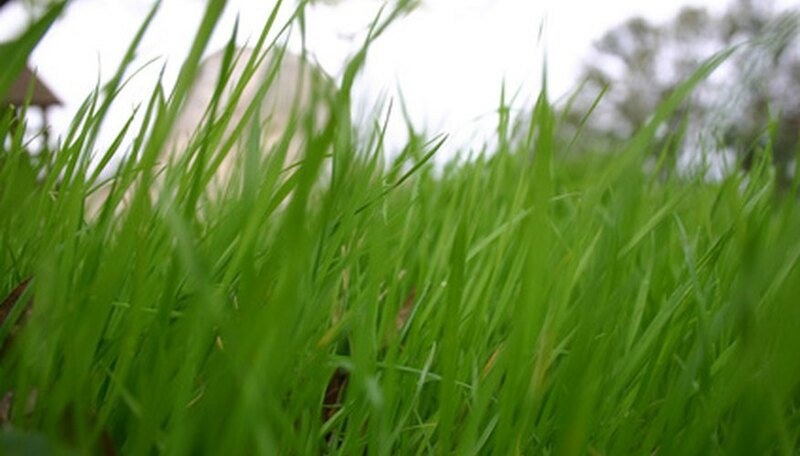 Nitrogen is responsible for giving your grass its green color and facilitating growth. Phosphorous helps roots grow and develop. Potassium is necessary for overall plant health. Milorganite is a constant combination of five parts nitrogen, two parts phosphorous and no potassium (5-2-0). It also contains 4 percent iron. Scotts fertilizer contains various combinations of nitrogen, phosphorous and potassium, depending on what you’re using it for. Winterizer contains 22 parts nitrogen, 2 parts phosphorous and 14 parts potassium (22-2-14). Scotts Weed and Feed contains 22 parts nitrogen, 3 parts phosphorus and 3 parts potassium plus an herbicide (22-3-3). A high nitrogen count will cause your grass to become green, and Scotts fertilizer has it. But not only will the grass become greener, it will also grow at an accelerated rate. This causes more frequent mowing. Milorganite contains a much lower amount of nitrogen but adds iron, which keeps the grass green but does not accelerate lawn growth. It is considered a slow-release fertilizer. Milorganite is considered organic fertilizer. It is created through the process of microbes digesting nutrients from the sewage stream flowing into Lake Michigan. In fact, the name Milorganite is derived from the first syllable of three words: Milwaukee, organic and nitrogen.